Did you know that this blog is four years old this month? Yes, I must admit it took me by surprise as well, especially since I am the queen of 'why-do-it-today-if-it-can-be-abandoned-tomorrow' philosophy. My original reason for starting the blog was really simple. After my appearance on Masterchef, I started receiving a ton of requests for the recipes I made on the show. Instead of emailing everyone who asked a recipe, I decided to start a blog, and post up all the recipes on here. So why call it Food, Football and a Baby? Well, refer to the paragraph above. I was so sleep deprived, I could barely function, let alone think of a cool name for the blog. So I called it after the three things that defined my life at that time. Food, of course. Football, of which I am still a passionate fan (Please, Gunners? Please? One trophy to console us all after six years? Please?) And the baby, who is of course, no longer a baby, but will always be my baby, if you're getting my drift? Things have moved on in my life since those years of course. Two years ago, almost to the day, we upped and moved from England to Canada. And suddenly, for the first time in my life, I had time. Sleep, of course, was a little longer coming by, but time I had. I started blogging more, with a purpose. Well, mainly to keep me from going loco, as I adjusted from being someone who was always on the go, to someone who was a stay-at-home-mum. And I freely admit, I struggled with it at first. My job and education, so far, had been my identity. And to let that go, and surrender financial control to my husband was a really, really hard transition for me to make. I look back on my first year here in Canada, and I cringe to think what I must have been and sounded like. I hated the cold, and the fact that my family and friends were so far away, and, as I put it, I basically sat indoor and sulked. The next year, I realised that sulking would do me no good, so I went out and started to get to know people. I took a few leaps of faith, and suddenly I now have friends who are on the way to becoming really close to me as well. Blogging played a huge part in this transition. I learned a heck of a lot on my journey. I carved out a niche for myself. I started getting to know people, taking part in events and, most of all, realised that I could do something special with my passion and knowledge of food, particularly Indian food. I was lucky to find people like my friend Kathryn, who gave me a chance to prove myself in teaching. I found new purpose in life, and I am lucky enough to be able to now start thinking about making a career out of it. Blogging gave me all this and more. A lot of people claim that blogging is a solitary, unfriendly and highly competetive world. I think that's a hugely unfair claim to make. My community and social network of friends started with blogging, and we are hardly the competitive people that the world makes us out to be. All we, and I, do is strive to be the best we can. And that's a natural part of things that we have in common, which, incidentally makes us such good friends. So, thank you to all of you out there for easing my way in this world. Its a cliche to say it, but you know who you all are. Thank you. I couldn't have come this far without you. So, anyway. To celebrate four years of blogging, I wanted to post something really special, and something that totally evokes what this blog is all about. Creating a home away from home, to be precise. 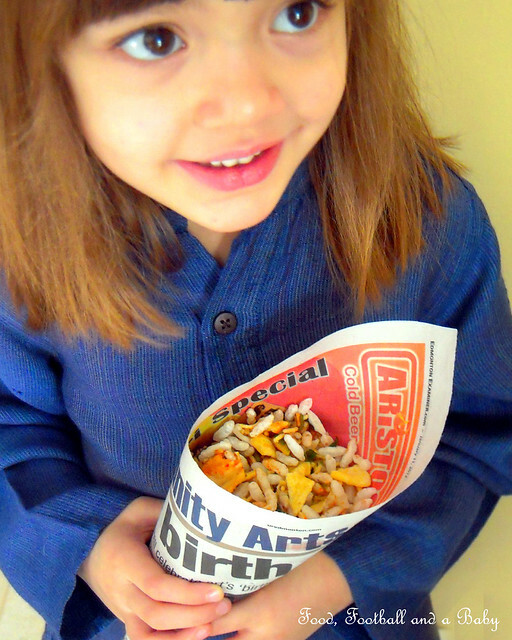 And what better way to start off my fifth year of blogging than with this utterly Indian street snack, the bhel puri? Bhel puri is one of those words that instantly evokes childhood and adolescence for many of us. Growing up, we didn't have a huge amount of entertainment that kids today have. An outing basically involved us heading to the beach with the whole family and a sizable chunk of the neighbourhood in tow. We would race along the waves, get totally soaked to the skin, dare each other to go out further and further into the sea, totally ignoring the shrieks of our parents as they yelled at us to be more careful and not get swept away. And then, as a special treat, we would be treated to bhel puri from a nearby vendor's cart. We would look on, awestruck, as the vendor quickly chucked puffed rice, papri/ papdi (crisp chickpea chips) and sev (long thin noodles) into a big open pan. He would then toss in a handful of diced onions, perhaps some spicy chickpeas and some fresh coriander into the mix. Then splatter on some chutneys, whisk it all together and ladle it into newspaper cones, then pass it on to our eager hands. And oh! The explosion of flavours and textures that greeted our first bite. Sweet, salty, spicy, tangy, crisp, chewy, soft.... they were all there. Nothing comes close to savouring bhel puri on the beach as kids or as teenagers, bunking off college to hang out at the beach or at the local chaat-wallah. It was all these memories that spurred me on to try and make my own bhel puri to celebrate the end of four years of blogging. I experimented witha fair few recipes to come up with this one, which is adapted from Tarla Dalal and Sanjeev Kapoor (both doyennes of Indian cooking) I changed up several elements in these recipes, as I don't really love super spicy food anymore, plus of course, I needed to mild things up for Aditi and Kay. Sourcing the ingredients for this chaat was not difficult at all, not even here in Edmonton. I bought the puffed rice at an Indian grocer on 34 Ave. The papri and the sev, I found in the Superstore on Calgary Trail. Superstore actually has a really fantastic selection of South Asian groceries, especially if you don't have the time to get to the stores on 34 Ave. I've been pleasantly surprised by the range and quality of their Indian snacks, and they stock the Haldiram's brand, which is my favourite. This snack is actually really quick to put together, if you make a few advance preparations. 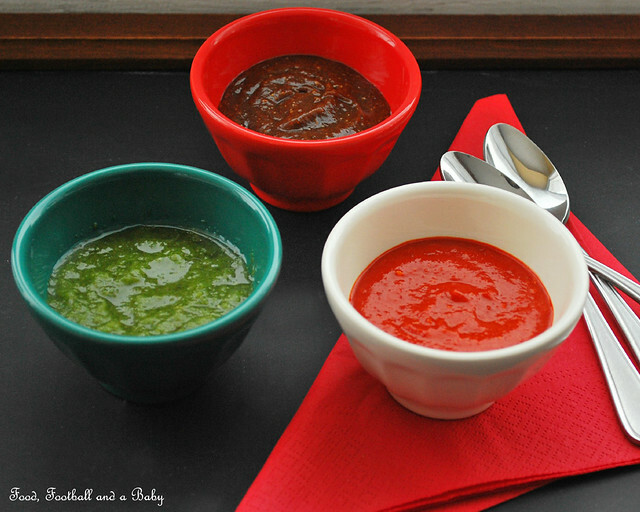 I almost always make my chutneys in advance, as I like the flavours to blend together and mellow out. So I made all the three chutneys that go into this chaat the night before. 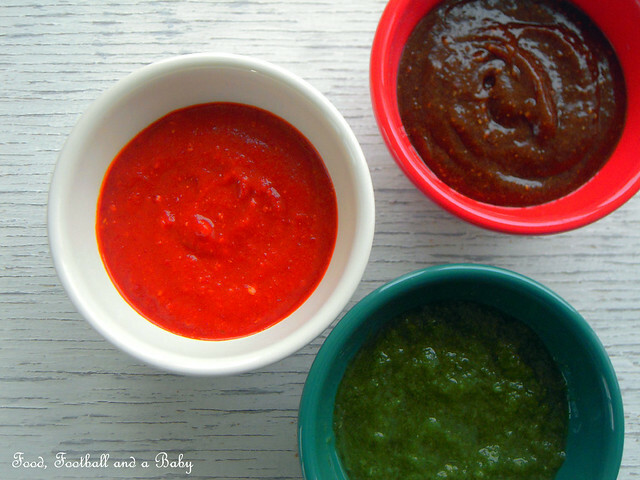 I made a mildly spicy green chutney with mint, coriander and lemon juice, then a hot and spicy red chutney with garlic and Kashmiri chillies. I then made a sweet and sour chutney with dates and tamarind. I blended them all up, and then stored them in the fridge. The next day, I put together this delicious chaat, and served it up with a hot cup of chai. There are so many days I miss my home country so much. My family, my friends, the colours, the heat, the dust, the crazy loudness... its hard being away and so far away from a country that shaped and defined me as a person. But in the end, I relax, because I know that as long as I am able to recreate the food of my childhood, and bring back those memories, India will always be close to me, however far away I am. I am grateful for everything and everyone of you that reads this blog. Corny it may sound, but without you all, this blog would not be anything like it is at present. You, my friends, are what define me. So thank you, and here's to another year of blogging, and all its challenges and successes. Add salt and sugar to taste and adjust according to your taste. Place the dates and palm sugar in a small saucepan, along with the ¼ cup water. Bring to a boil, then turn down the heat and simmer for about 5 minutes until the dates are very soft. Place this date mixture in a blender, along with the tamarind paste, green chilli, sugar and salt. Blend to a fine paste. Taste and adjust the sugar/ salt to your taste. Shred the chillies loosely, then soak in the ½ cup boiling water for about 5 minutes. Blend to a fine paste. Add the salt and adjust the seasoning to your taste. Place the puffed rice, sev, papri and the kosher salt in a large bowl. Add the diced onion and stir gently. Add the cooked potato and chickpeas, if using. Add the chutneys, and toss together well. Sprinkle over the fresh coriander and stir in quickly. Serve immediately with the additional papri sprinkled on top, and with the chutneys on the side, to add to the bhel puri to your taste. Goes well with a steaming hot cup of chai. Note: Dilute the chutneys with a little water if they are too thick. Oh just what is this week ?? Street food rains all over anyway michelle loved your take on chaat and loved the clicks there s an event on my blog try and link up the recipe and congrats on the Blogoversary!! Happy Blogversary Mich!!! Wish u many more milestones - continue blogging & entertaining us with your great writing, pictures and recipes for many many more years to come!! It's great to have gotten to know you, thanks to your blog!! All the best! 4 years! That's awesome! Congrats! And the bhel puri looks really good! :) You were on Masterchef America? Happy 4 month blogoversary. i love the name of your blog, its unique and memorable! lovely clicks, yummy bhelpuri and a lovely daughter! 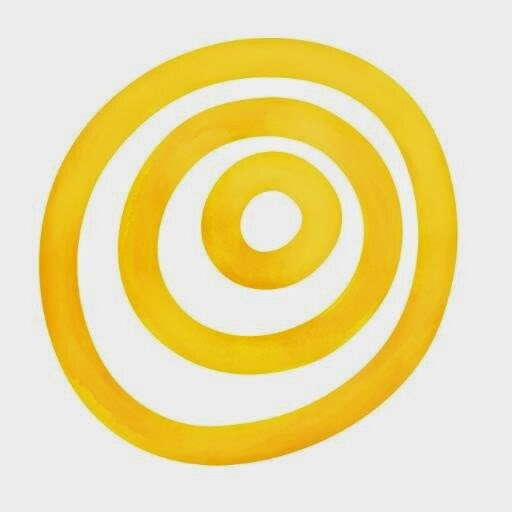 Happy 4th Blog Birthday to you. 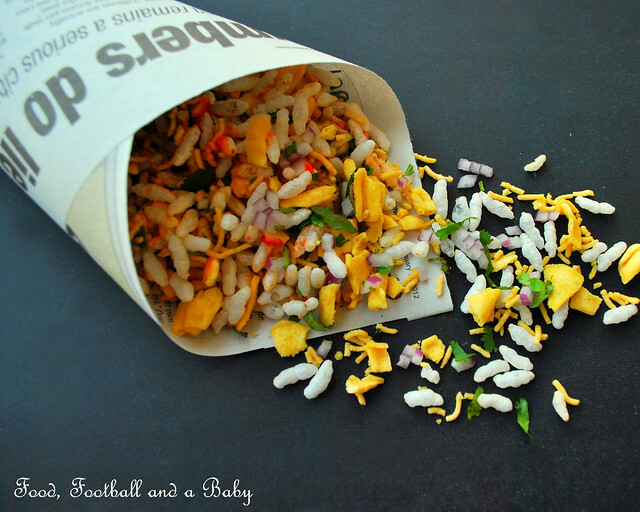 Love the clicks and the bhel puri looks very inviting. the reasons for the blog and reading more about you as a person helps connecting with you a pleasure. Congrats on the huge milestone :) Love the first picture! Too cute! Happy 4th bloganniversary! May u celebrate many more. I am making bhel today .. but no red chutney, just hari chutney aur meethi chutney! psst.. I like ur princess more than the bhel...she is a-d-o-r-a-b-l-e! Four years! That's serious - happy anniversary. 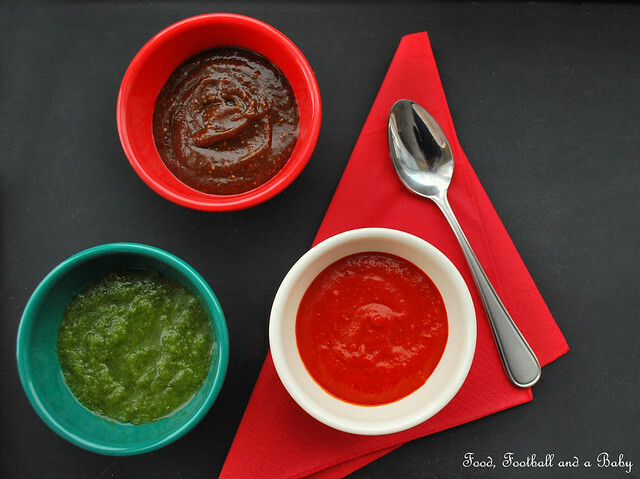 I love those chutneys - don't know why I don't make more green chutneys since I love those fresh tastes so much. Great pictures, by the way. Congrats on year 4! Your daughter is such a cutie with those great big eyes! It was worth the wait after your twitter teasers!! Such a delightful journey. It is so evident that You enjoy creating this space and fill it with stories and memories and laughter. Keep building this treasure, Michelle. very nice article post by you.Thanks for sharing.Here I would like to introduce Delights of India,which is a directory to buy Indian snacks. Hi Michelle, greetings from Harare. Congratulations on your blogoversary--did I spell that right? 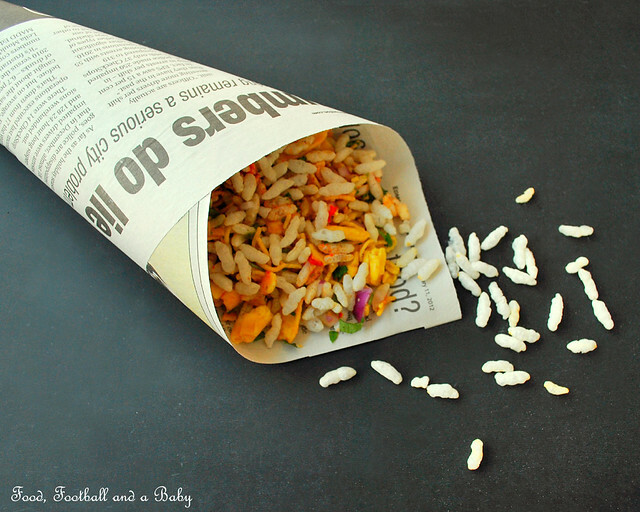 I really liked the photos, the Bhel Puri looks really appetizing. Your daughter really is a princess, you must be so proud. I came to your blog via the kitchn. What an amazing blog you have, with your stories of India, the rain holidays, hahaha and how you would get off school. And I thought we were naughty as kids. Your recipe for Bhel Puri is great, I would really like to make some, to surprise my family. I've seen a local version here, called Chevra. 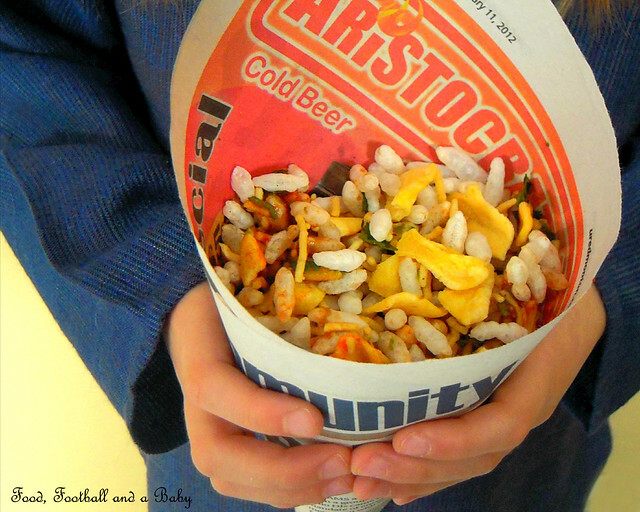 It contains puffed rice, peanuts, chillies, tumeric, sugar, salt and maybe some fried coriander leaves. Now here is a question for you: do you have a low sodium and diabetic-friendly version I can make for my mother? I hope so. Take care, have a great day.